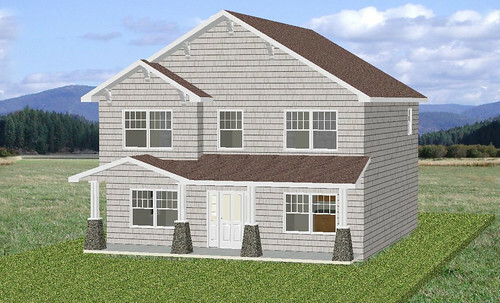 After weeks of meeting remotely with our builder and architect, we have finally decided on a front elevation. We had no idea that things like position of the roof line or type of windows could drastically change the price of the house. It took us a while to figure out what we didn’t like about it. We thought it was the roofline, so after a few more rounds of changes, we ended up with this. We thought this was a lot better, but then we learned that this type of roofline, a reverse gable, would cost over $10,000 more! Also, the little dormer window in the attic, would add about $3,000 more to the total cost. We are on a very tight budget, so these changes were not possible for us. After one final session with the architect, we finally landed on this front elevation. We really love it. We may change the center window on the second floor to an octagon. 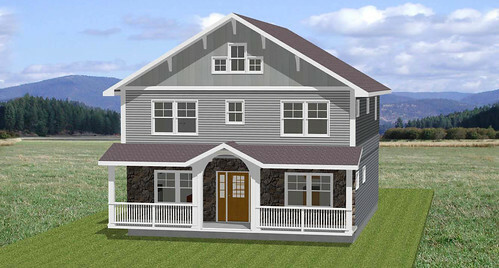 We’ll also play around with the color of the siding and maybe add some bead-board to the top of the house. But overall, we are pretty happy with the design. We are submitting the plans to the engineers and waiting for everything the get approved. We’re really moving along now! 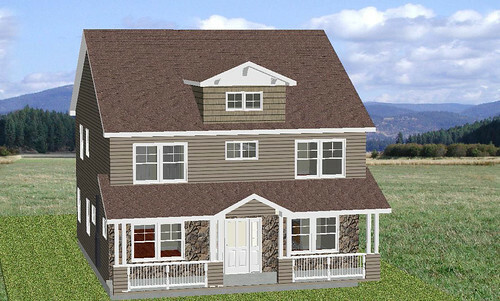 This entry was posted in House Plans, Uncategorized and tagged architect, builder, dormer, front elevation, front porch, modular, new construction, reverse gable, roof, siding, windows. Bookmark the permalink.